We all need quick and easy from time to time. 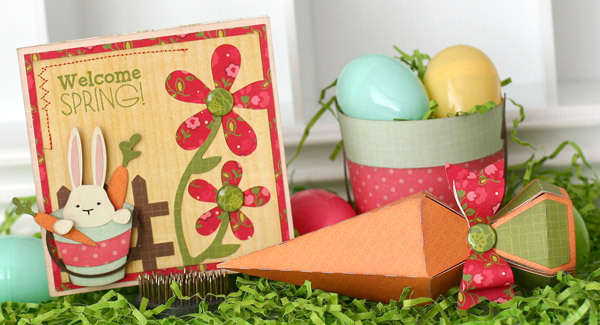 I’ve created a spruced up ’five minute card’ with a cute carrot treat box. You can make this too.. a great project for a beginner! Size all shapes to width or height indicated using "keep proportions" or "aspect lock". Cut your flower card base and panel. Open the flowers_cutout file. Right click and select ’break apart’, remove the far left flower leaving only two flowers. Cut. You’ll then cut the stem as is, then just use scissors and trim off the ’extra’ stem. Adhere card pieces. 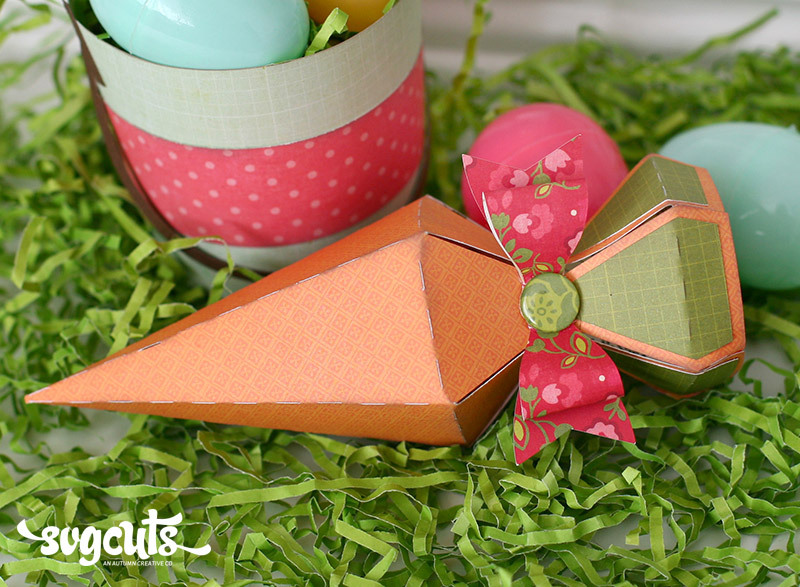 Cut the fence from Easter Bunnies SVG Collection. Adhere to the bottom left of the card, you’ll need to trim off the edge a bit so it doesn't hang off. You could always cut the fence a bit smaller, but it would be blocked by the bucket bunny. Adhere fence to card. Cut your bucket bunny and layer some pieces with adhesive foam for dimension. Add the two carrots, one in the bunny’s hand and the other inside the bucket. Adhere the bucket bunny to card. Stamp your sentiment, add some stitching, and epoxy shapes. Lightly ink your edges in gray and you’re done with the card. Cut the carrot and ’green’ parts at 11.00” wide. Ink your edges in grey. Assemble the box and embellish with the 3D bow and another epoxy shape. With the look of this paper it gives a slight vintage feel to it, so I thought adding grey ink to the edges was a nice touch. Inking your edges also helps layered die cuts have a bit of dimension. 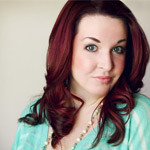 Especially when layering light colors over each other. 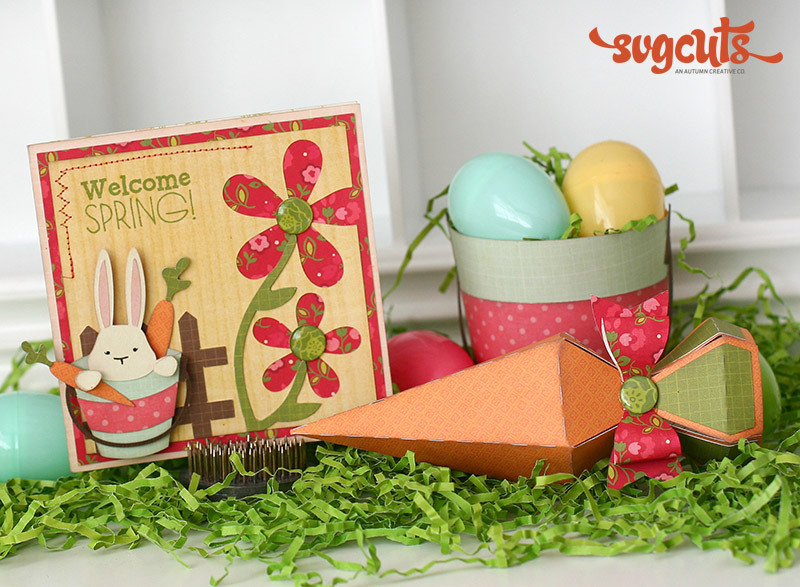 I added carrots to this card to ’pull together’ the look with the carrot treat box. This simple added element made it look more like a set. Add dimension with adhesive foam. Glue Arts makes ’You Cut It foam which is great to cut however large or small you need. Machine stitching is a fast and easy way to add an extra something special to a project. Like a finishing touch! Make it your own by using different papers, buttons, twine, etc. You can even add a different bunny! Add some buttons, a bunny, twine, etc. to the carrot. You can even add a tag with a name or sentiment on it to personalize your gift. As always, I hope you like this project! 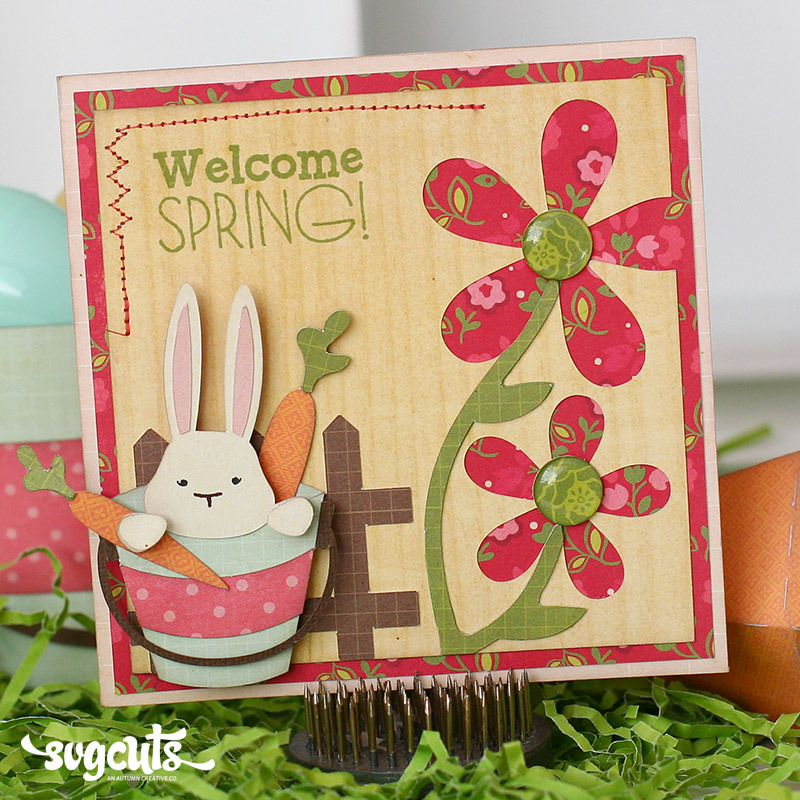 Even if you don’t make this ’exact’ card, I hope it inspires you to jazz up some other card bases and make them your own! Happy crafting! So Cute!! I just adore those colors!